Cozido de Inhames com Carne, or Beef and Yam Stew, is a very traditional Portuguese eat. A cozido is a Portuguese stew that combines many typical ingredients and spices to be slowly cooked into a hearty and flavorful dish. 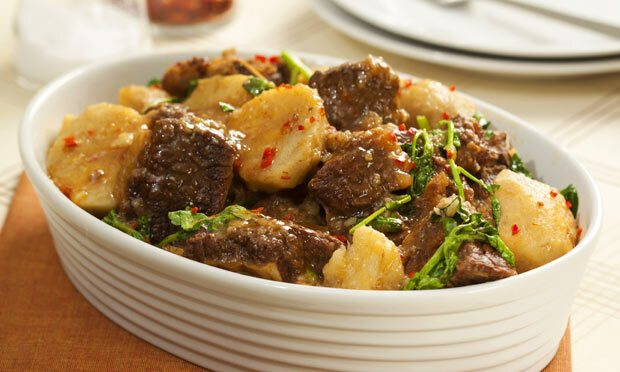 This beef and yam stew combines the unique flavor and texture of yams with some nicely spiced beef into a delicious and filling meal. 1) In a saucepan, add the olive oil, garlic, onion, paprika, beef and sauté them, stirring well. 3) Close the pan and place over high heat. When it starts boiling, turn the heat to medium and let it cook for about 20-25 minutes until the beef and yams are both tender. 4) Once they are done, remove from the heat and let it cool for about 5 minutes. Pour into a platter, cover with the chopped watercress, and serve while hot.